In the amazing song Biko, written by Peter Gabriel, he sings the following lyric: “You can blow out a candle, but you can’t blow out a fire. 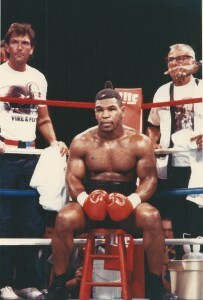 Once the flames begin to catch, the wind will blow it higher.” This very lyric sums up the relationship between the former two time Heavyweight Champion of the World, Mike Tyson and Steve Lott. Steve, no stranger to RSR has been here before several years ago when he did an in depth interview with us. At that time, he revealed his soul, speaking about someone he truly loved (Mike Tyson), but not did cover up the warts and the bumps that the onetime baddest man on the planet had shown through the years. That was over 8 years ago and today, in 2014, the wind is a metaphor for his love and respect for Mike which has truly grown higher. Loyalty in this world seems a truly dying trait but when I see it anyone these days, I really respect it. Steve Lott has earned my respect. 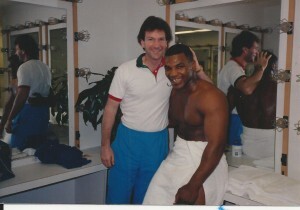 In this interview there is so much more than just Mike Tyson. Read further about a man with a Boxing IQ off the charts who has been around the sport more years than most. BB: You have been involved in boxing for so many years. What is your current endeavor in the sport? 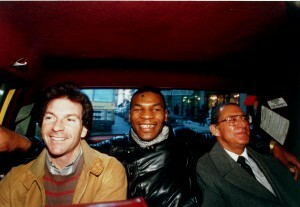 I work for Mike Tyson and Garry Jonas at Iron Mike Productions. They started this boxing promotion company last year. 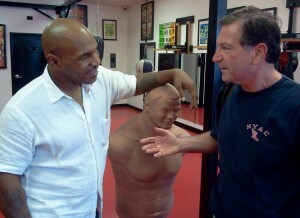 BB: Discuss the Boxing Hall of Fame. Both Bill Cayton and Jim Jacobs were eagerly seeking a hotel/casino in which to build the new Boxing hall of Fame. Since their company, Big Fights, Inc., owned and controlled all the legendary fights in history, it would be impossible for any other Boxing hall of fame to display any of the fights of Muhammad Ali,Sugar Ray Robinson, Joe Louis, Marciano, Armstrong, and every other legend in history. 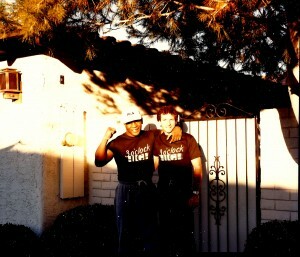 After they died I continued pursuing the opportunity and finally was given a space at the Luxor here in Las Vegas. It was located in a large sports attraction called SCORE. I don’t know how he did it but the developer made deals with almost every hall of fame for them to permit him to place exhibits in SCORE. When the developer found out that I owned the HOF rights to the ESPN film and tape boxing library he contacted me and we entered into a deal to place the Boxing hall of fame at SCORE along with the other HOF exhibits. Unfortunately, he recently lost the lease on the space. We are now looking for a new venue for the BHOF. BB: When did you first start following the sport of boxing? What got you into it? I was not a boxing fan growing up. I was the National Junior Handball Champion when I was a teenager. I met Jim Jacobs who was the world champion. 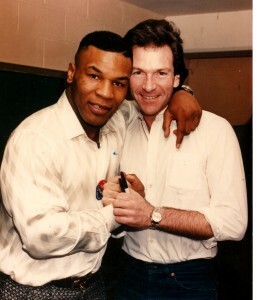 When I turned 21, I asked Jim for a job at the Big Fights Company and my life as a boxing fan began. BB: How do you feel from the time you did start following it to current day, the sport is doing? The sport is doing well now due to the huge audience of Latino boxing fans. Since boxing left network TV, and there is a lack of exciting knockout young punching fighters, the “white and black” (pardon my words) mainstream audience has left boxing. 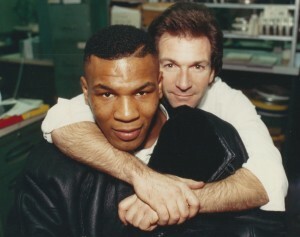 BB: I don’t think I have ever seen someone more vocal/loyal to a fighter than you are to Mike Tyson. How did you first meet Mike? From the early 70’s Jacobs and Cayton were funding the training camp that Cus D’amato had in upstate New York. Every once in a while he would call and say hi he has a great young prospect. 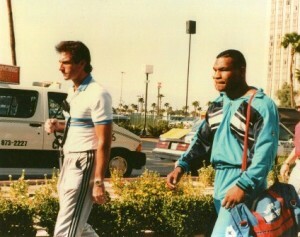 In 1980, he called and said his newest prospect was a kid named Mike Tyson. 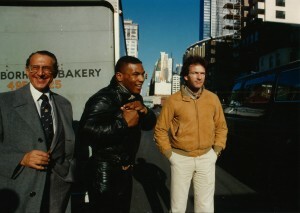 First time I met Mike was for about 5 seconds when in 1982 he came into the city with Cus. Then, in 1984 he stayed with me in my apartment in the city for two weeks while he had therapy on a hand injury which delayed his professional debut. Then, after each fight, he would stay with me in the city for a day to take a break in between fights. When he became champ he would stay for two or three weeks. 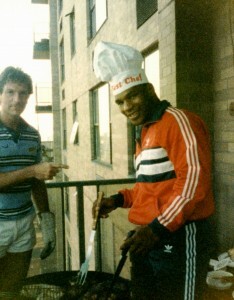 People could not believe that the heavyweight champion of the world was sharing my apartment and sleeping on the couch no less! BB: During the early years, in what capacity did you work in the Tyson camp? 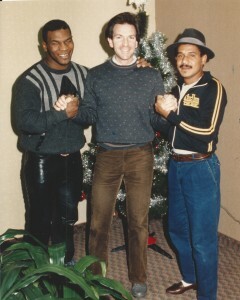 Once Jim and Bill signed for the fight, all the various details were turned over to me: all travel, sparring partners, hotels, medicals, press, interviews, etc. BB: Who are your three favorite fighters of all time and why? 1. Joe Louis – perhaps the most loved and adored athlete in history. In most polls, “most dramatic” sporting event in history, the ranking is many times number 3 – Ali vs Frazier 1st, number 2 – Jesse Owens 4 gold medals running in front of Hitler at the 1936 Olympics held in Berlin, number 1 – Joe Louis knocking out Max Schmeling in 1938 at Yankee Stadium. Please remember, Max had KO’d Joe in 1936, it was the beginning of WW2, the entire world was watching, oh, and by the way, the President of the United States, Franklin Roosevelt called Joe before the fight and told him, “we are counting on you Joe.” Talk about pressure! BB: What is your personal favorite boxing match of all time and why? 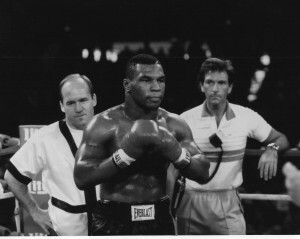 Please remember I had the honor of walking into the ring with Mike when Mike “was Mike.” So, I will not add the (Trevor) Berbick, (Larry) Holmes, or (Michael) Spinks, events here. Other than those the answer is easy – the “Thrilla in Manilla,” Ali vs Frazier 3rd. Why? Jim took me to the fight. Every time I see the fight I can see me and my girlfriend right there in row 3. Man, talk about memorable! BB: Why do think the MMA is promoted better than boxing is today? in the Octagon. Of course, this huge mainstream audience paying for the events permits the MMA to spend much more than boxing on commercial time and advertising. Boxing trainers must teach their kids from the first day to be aggressive and thus entertaining. Box and move, box and move won’t cut it – period. BB: What would it take for ABC, NBC and CBS to bring boxing back to their sports lineup? Two things: 1. as I said earlier, boxers must be more exciting or 2. the fight cards would be priced so inexpensively that the networks would take the events place the events in slow time periods. BB: What is one thing you can share with the RSR readers that may surprise them? I still get emotional every time I see Mike, whether it’s a video, photo, hear his voice, or especially when he walks into the office here at IMP. BB: If you could meet any person from anytime in history, who would it be, and what would your first question be for them? Ava Gardner – first question – “will you have dinner with me?” Absolutely mesmerizing woman. BB: Do you favor a mandatory retirement fund for all boxers and if so, how would you like to see it finally accomplished? I would love to see a mandatory retirement fund for boxers. This will probably never happen. IMP aside, promoters would be very reluctant to invest. And, the only fighters who could afford to invest are the marque fighters and there are very few of them. BB: Finally, what is the saying you live your life by? “Don’t Quit” – Cus and Jim’s favorite poem. Check out the entire poem on line – you will never forget it. RSR readers, if you have the time, please review the history of the sport. I doubt very few young baseball fans know who Hank Greenberg was. It would bode well for boxing if every young fan, in addition to fighters like Ali, Robinson, Louis and the other well-known legends – learns about warriors like Beau Jack, Carmen Basilio, Billy Conn, Gil Turner, Ceferino Garcia, and others.